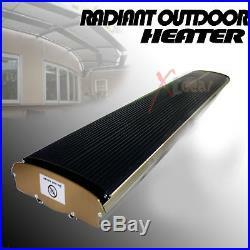 110V Radiant Outdoor Heater For Patio Ceiling Wall Mount Infrared Radiant. Far-Infrared radiant heater is produced by unique design and manufacturing technique. Adapoted special aluminum alloy radiation panel, surface of panel process with special coating inside of panel embed with heating element, then generate and transfer heat to human body. The heat is pread in the form of radiation, emitted from radiant panel surface, transferred to human, around the room area. Comfortable radiant warmth, offering efficient and cost effective heating No wind, Light or odor will be caused during the running so the indoor air is clean without floating dust. Subtle minimalist design featuring a black anodised aluminium finish. No internal moving parts, creating silent and maintenance free operation. Metal radiant heater – no glowing element. Energy Saving: hight heat generation efficiency and good heat radiation effect, controlling the temperature intelligently and saves power and energy. Adjustable wall and ceiling bracket. Designed for outdoor use. Ideal for use under verandahs, garages or alfresco areas. Overall Dimension: 39-1/4″ (W) x 7-3/4″ (D) x 2-1/2 (H) Maximum Output: 1800W Consumption (approx): 1.8 Kw/h. 110V/115V 60Hz 13A The Electric Heater range includes a number of heating options. From free standing, to wall and ceiling mount versions. Electric Heaters offer easy installation and minimum clearances, therefore they can be mounted or positioned under canvas or timber eaves The perfect solution to extend the season of outdoor. Cover aprox 250 square feet area each unit. PROFESSIONAL ELECTRICIAN INSTALL RECOMMENDED. Please make sure you order the correct item as orders cannot be altered after the order is paid for. The flat rates quoted in the table will apply to most destinations in the countries/states listed. Occasionally (usually, but not always in remote/rural areas), some addresses will not qualify for the service or rates that are quoted. We reserve the right to cancel an order or terminate a sale for any reason. All items are 100% brand-new, and not refurbished in any way, unless the listing specifically states otherwise. Boxes may be opened for the purpose of testing, inspecting, photographing, adding additional padding/packaging/instruction supplements, or ensuring the completeness of the item. Customers must return all items in their original condition which include the original Packaging accompanied with packing slip, Documentation & Manuals and Accessories, etc. We welcome and treasure all of our customers. Listing and template services provided by inkFrog. The item “110V Radiant Outdoor Heater For Patio Ceiling Wall Mount Infrared Radiant” is in sale since Friday, March 20, 2015. This item is in the category “Home & Garden\Yard, Garden & Outdoor Living\Patio & Garden Furniture\Patio Heaters”. The seller is “xtgear” and is located in Rowland Heights, California. This item can be shipped to United States.